Sonia28 Jie has impressed many fanshionistas with her daring necklines and elegant silhouettes. Her line, Son!a, provides the women who seeks chic and provocative everything she needs to complete a polished, formal look. Pictures fail to accurately portray the vibrant colors and detailed textures of Sonia28’s garments. The tasteful drama of a Son!a gown must be appreciated in person and transforms the wearer into a queen for the night. Sonia28 gives us insight into Son!a. Christiana: How long have you been in Second Life (TM), and when/how did your business begin? Sonia28: I am sixteen months old. My business started a year ago in a 512×512 land with a few designs. Christiana: What sparked your interest in starting your own line? Sonia28: I started designing when I was 3 days old. I searched for tutorials. The tutorials on Natalia Zelmanov’s “Mermaid Diaries” blog were particularly helpful. In addition, I used my formal knowledge in Illustrator and Photoshop. Creating a line or collection was what drove me into Second Life (TM). We’re all Glowing after Happy Hour! The time has come again for my favorite designer spotlight: Happy Hour! If you haven’t yet had a chance to join us don’t hesitate to join the ~*Ewing Events VIP Guest List*~ group. We hear from the hottest designers and get news and invites on all Ewing Fashion Agency’s events. For all you fashion lovers out there, this is the group to join. This week I’m ecstatic to write about Glowing Gems by Jenny Thielt. Don’t let the fact that the store has been open for less than a year fool you; Jenny has been designing since she joined Second Life (R) almost 2 years ago. She has taken jewelry inworld to a whole new level. The first time I spoke to Jenny about my love of her jewelry I was delighted to find that she doesn’t use bling! Yay! No more “bling off” commands every time I place my jewelry. Instead, the Glowing Gems pieces do just that, they slightly glow, and the effect is amazing. She focuses on simple elegance, nothing too gaudy. Glowing Gems enhance instead of detract from your overall appearance. Through Second Life (R), Jenny has found a place to release some of her creative energy. She has enjoyed the endless possibilities presented inworld and has created an amazing place for jewelry. That isn’t all, though. Jenny has been insanely busy releasing a new line of skins and setting up an affiliate program. There are awesome things going on down at Glowing Gems and a stop in her store will show you just how amazing her work is. You can find her jewelry and her skins at Agard. 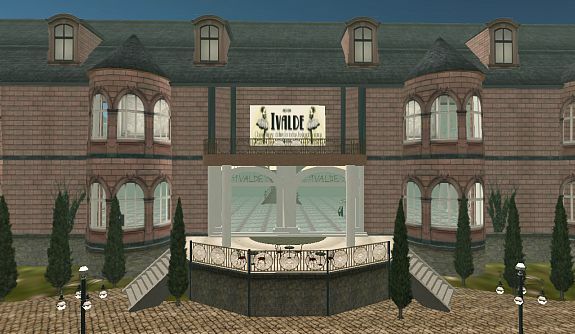 There are many well-known and popular designers in Second Life. They owe their success in large part to the quality of their work and uniqueness of their designs. All these successful designers had to start as unknowns and build their reputations over time. When I find a lesser-known designer with excellent and creative works, I like to call people’s attention to them. Alba2 Rossini of Alba Fashions is a designer that I have been aware of for some time but is less known than she deserves to be. Her designs are extremely creative and her work is exceptional. She draws on many elements to create her designs, including fantasy and nature. Below, I present several styles that demonstrate the range of her creativity. It’s always nice to find a store that makes you want to visit frequently. You start aisle by aisle, picking out what you will buy, and what’s going to be your future purchase. Once you join the update group and you know what the newest hot items are, they must be added to the list too, or be bought. Maybe I should just IM the owner and ask for a flat rate, one of each to go?! Shop Category: Vintage clothes with an antique look. Victorian, Edwardian, 20`s, 30`s, 40`s, 50`s, 60`s, 70`s, 80`s, Pin-up, Retro, Rockabilly, Disco, Gatsby, Empire, Civil War era. Elegance, power, sophistication, style, and glamour are five words used by Valenttina Carfagno to describe her line, Frozen Turquoise Valentine (FTV) [landmark]. FTV appeals to a broad range of personal styles by providing individual elements in each look designed to mix and match with other outfits. FTV vibrantly reinteprets classic designs through a youthful lens and incorporates haute couture sillouttes in ready-to-wear garments. I sat down with Valenttina to discuss her creative perspective. Valenttina: I have been in Second Life (TM) since May 2nd, 2007. So you make the math… hahaha.. and I started designing pretty much since September last year but the business really started off in October… so Frozen Turquoise Valentine is about to become a 1 year old toddler. Christiana: How did you come up with the name Frozen Turquoise Valentine? I love it! Valenttina: Thanks. I’m a turquoise lover so I wanted that in the name… Valentine is both romantic and a version of my Second Life (TM) name. And frozen because I love sparkles and frost… So it was a great mixture of things that resulted in the brand name! Valenttina: I have always been a fashion girl… I have this genuine love for it and getting to Second Life (TM) just made me realize that more. Then I got caught in the design world and discovered I was truly passionate about it. Today I am showing off a set of lingerie in three colors and the set is labelled ‘Debauchery’. I got a request from the designer Hollee Dion to review the set as it has just been released. It’s available in nine colors in total. Individually a set is 90l, or the full collection of nine is available for 240l. All come with tatoo friendly layers and are mod, no copy, transfer. Hey EFA fans, this is Capri Dubrovna! When thinking about what to blog about for my very first EFA blog post, I tried to pick something that would truly represent the theme of my weekly blog: luxury. Each week I’ll be blogging about an item or items that most would consider an indulgence – those fancy things in SL that we buy because we can’t afford them in real life! For my first post, I wanted to introduce this theme with something exquisite – and I found that something at Arachne Silks. What could be more luxurious than lingerie – SILK lingerie? I learned of Arachne Silks, and designer Celadori Sakai, when I randomly asked one of my groups where I should shop for the afternoon. As soon as I landed in the store, I knew that these designs would have to be included in a luxury post. The beautiful, silken textures and many “extras” that come with the outfits really make them a great splurge. The designs themselves, which come in several jewel-toned color options, conjure up images of sensual waterfalls in India, or the colorful temples of Arabia.